Due to the rarity and high cost of some of the new internal engine parts we offer a service of labor that includes machining and assembly leaving the parts requirement open and supplied as necessary. Upon inspection of your assembly we would then give a list of parts required for the project. If preferred we can acquire the parts and bill you on an as needed basis at wholesale cost or you can source the parts on your own. Generally the parts cost for the shortblock assembly alone are approximately $6,900 retail. 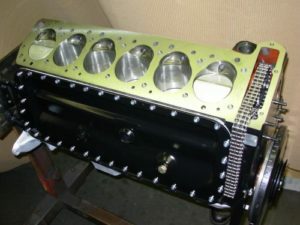 New parts for the head and valve train assembly can range from $6,500 to $14,500. Special repairs may incur additional charges (ex. crack repair, extensive welding of cylinder head). Warranty: No warranty implied or otherwise. Due to the numerous factors unique to the M198 engines which contribute to their challenges such as the availability of new parts of proper fit and function (some of the new parts from Mercedes are not to proper specifications) and the limited access to core components that are often compromised in ways that can make the repair irregular or extensive. In essence, we often have to adapt or improvise beyond normal procedures to what may be available. Therefore, due to the dynamics of all this and the issue of just how time consuming these engines are every step of the way, we cannot imply a warranty.